In the spring of 2007, the Golden State Warriors became the darlings of the basketball world because they entered the postseason playing what seemed like a reckless style of basketball and upset the team with the best record in the league in the Dallas Mavericks. The playoff run enhanced the legacies of Baron Davis (always been known to be a terrific playoff performer) and Stephen Jackson (we might forget this now, but Captain Jack guarded Dirk Nowitzki and owned him in that series) given the way they played brilliant basketball for the Dubs. They scored, rebounded, defended, passed, ran the offense and stepped up late in games and made big plays; basically they played like superstars. Davis and Jackson’s contributions were extremely important, mind you they completely overshadowed the talent and production of the team’s unsung hero: Jason Richardson. J-Rich was known around the league and amongst the fans as a dunker. A spectacular one. His performances in the NBA’s All-Star weekend dunk contests made it as such that everyone knew that he was a not only a phenomenal leaper, but a creative one as well. As a result, few people actually paid attention to Richardson’s overall game. His field goal percentage could and should have been better, but for the most part he was a very good shooting guard during his time in the Bay. Once the playoffs rolled around though, we saw a slightly different Richardson emerge for the Warriors. However, as mentioned previously, not many people noticed because he had teammates that were playing spectacularly. Baron Davis was the star of the show. He was the point guard that did it all. He played the way we had hoped always hoped that Stephon Marbury would play: with poise. His physical talents as well as his understanding of the game of basketball always made him a matchup nightmare and this was on full display in the 2007 playoffs. Stephen Jackson should have been the sidekick, except he also played as if he were the star of the show. He imposed his will on his teammates as well as his opponents and brought a toughness to the team that had been lacking in years past. He backed down to no one, and was almost always involved when scuffles happened during games. For lack of a better term, these two were basketball gangstas, as in you did not cross them, talk trash with them and in some cases even bother making eye contact with them. They would embarrass you in a heartbeat. But for all the shine that Davis and Jackson got, it would have been awfully tough for them to get it without the presence Jason Richardson. During the 2007 postseason run, Richardson helped space the floor for his teammates with his shooting, but more importantly he did a better job of setting up defenders so that he could attack the rim. The end result was that he was better shooter from the field during the playoffs than he had been in the regular season, when usually it’s the opposite. J-Rich still had some good looks from 3-point range, but he also got his fair share amount of attempts right at the basket. As good as Richardson’s numbers were during the playoffs, his game was actually better. He intimidated big men with dunks and thus had defenders fearing his first step and he also on a few rare occasions swooped in for some spectacular rejections. 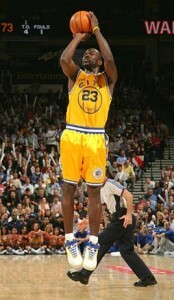 With that said, Jason Richardson’s biggest contribution to the Dubs that season was his shooting. Indeed, every time the Mavericks made a run against the Warriors in the first round of the 2007 playoffs, it seemed as though Richardson stopped it with a timely 3-point basket. And every time Golden State was in danger of having the game get out of hand, Richardson once again stepped up and kept them in striking distance. The box score might have read a mere 19 points in it next to his name, but his play during the 2007 playoffs will never be forgotten. The Golden State Warriors pulled an Ali and shocked the world, but none of it would have been possible without their unsung hero. Also, while we’re at it, might as well check out a montage of the playoff run right? J-Rich became the most overpaid 4th option spot up shooter in the NBA on the we believe team. Is that really the team we wanted to be locked into with long term contracts? It was a miracle run we had, but it was nothing more than a hot streak. We are lucky to have gotten out at the right time. Love JRich. Trading him began the unraveling of the “we believe” warriors. Not only was he the unsung contributor in 2007 like you said, but he was the fan favorite and the best player on all the 30-win teams that had preceded the 2007 playoff run. Trading him had the same effect that trading Mitch Richmond for Billy Owens had; the W’s were still competitive for another year or so but it gutted the soul of the team and started the bleeding of a long stretch of futility. And to think we traded him for Brandon Wright… excuse me, hold on a second… …sorry I just threw up after I typed that. That was a great time in my life. I would have loved to keep that team together for a couple more years.